Doubled down on Amazon, retooled loyalty, brought in new brands. 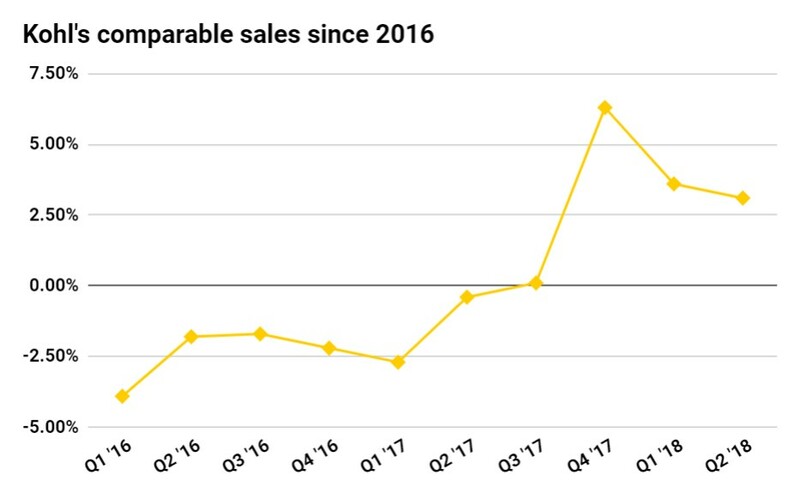 Four straight quarters of estimate-beating sales prior to Q3. Analysts consider it among the best-positioned department store chains. In 2014 Kohl's unveiled what it called its "Greatness Agenda," a series of initiatives to drive organic top-line sales. In the years since, it added to the strategic plan with new moves, both modest and bold, to position itself firmly as a leading department store. When the company said in 2015 that it was starting to see results, some were skeptical. Today, however, Kohl's turnaround appears to be on strong footing. And the retailer keeps making moves to become nimbler operationally and lure shoppers to its stores. This year is also one of leadership transition, as Michelle Gass (previously chief merchandising and customer office) took over the CEO spot from longtime Kohl's chief Kevin Mansell, who announced last year he would retire in 2018. The retailer, which has an advantage over peers in not being chained to enclosed malls, has cleaned up its stores and taken control of its inventory levels and clearance racks, according to Jane Hali & Associates and other analysts. On the merchandising side, as Moody's analysts pointed out, Kohl's inventory has fallen more than 6% each quarter since Q4 last year. The retailer has also sped up product flow for its private brands and is rolling out ship-to-store. GlobalData Retail Managing Director Neil Saunders noted in August that changes to its loyalty program this year have been well-received by customers. "Initial results from this appear to be encouraging, with customers welcoming the simplified rewards structure and the greater access to sales events and promotions," Saunders said. Not least of all, Kohl's has also partnered Amazon to sell the latter's tech products and take returns from Amazon customers. Although some analysts had viewed that as a potentially troubling move, it has been driving more shoppers to Kohl's stores, prompting more stores to participate. It's forged other partnerships as well, including with apparel maker POPSUGAR and Nine West — both of which could boost the retailer's millennial audience. In an October note, Cowen & Co. analyst Oliver Chen described a "triple success" at Kohl's driven by products, tactics and data. None of this was preordained. In August of 2016, Kohl's found a "ray of hope" even though its 1.8% same-store sales drop was below estimates. The period before it, Kohl's comps dropped by nearly 4%, and profits declined — unexpectedly — by 87%. The time before that was even worse. Annual comps at Kohl's were negative in 2014 and 2013, and top-line sales declined in those years as well. Operating income and gross margin declined every year from 2011 to 2015. Even in the early quarters of 2017 the retailer was struggling, posting sales and profit declines. It wasn't until the third quarter of last year that Kohl's finally broke a streak of negative comps with a modest 0.1% increase that came as a surprise to analysts. Flash forward to this August, when Kohl's beat analyst expectations on sales for the consecutive period, with a 4% spike. Comps in Q2 2018 rose more than 3%. Margins were up, operating income was up, net income was up. The quarter built on a strong first quarter this year and a 2017 that saw top-line sales increase 2.2% and comps that increased 1.5%. "These results are a direct reflection of the progress we are making on our key priorities, driving traffic and operational excellence aligned with our strategic pillars focused on production, personalization, value and the experience," Gass said in a conference call at the time, according to a Seeking Alpha transcript.